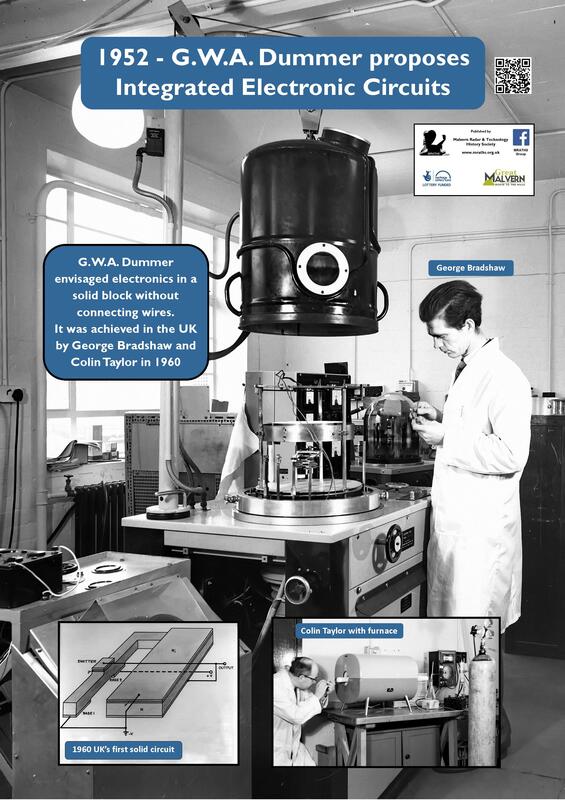 In 1952, as part of his interest in improving reliability of systems, Geoffrey Dummer presented a scientific paper in the US stating that it was possible to envisage electronic equipment in a solid block with no connecting wires. 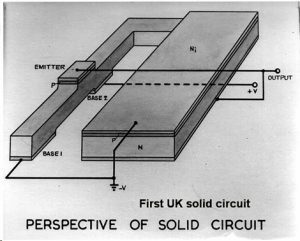 This was the first public description of an integrated circuit and had the potential to improve reliability (the mean time between failures – MTBF) by orders of magnitude. In 1957 at RRE, G.W.A. 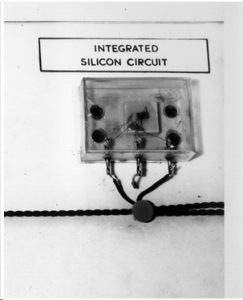 Dummer showed a nonworking integrated circuit. This was overtaken by the US in 1959, where Jack Kilby demonstrated the first working circuit. 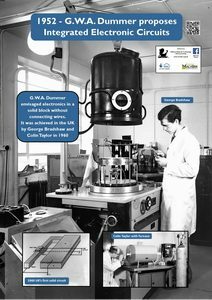 However around 1960, Colin Taylor & George Bradshaw produced the first solid circuit in the UK in the Geoffrey Dummer’s laboratory in A Block on South Site. 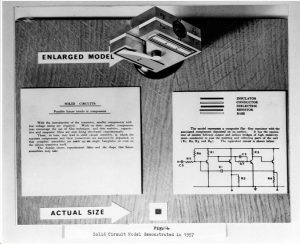 They believed that it would be useful in computers where a large number of very simple reliable circuits are required. Unfortunately at the time the Government & UK Industry were not prepared to invest heavily in the technology, leaving it to the Americans. This technology is in every electronic device today and has vastly improved the performance and reliability of all electronic devices. Both the first UK & US integrated circuits are now in the Science Museum.